The McIvor Shire (1864-1994) was proclaimed on 23 December 1864. Its area was 1295 sq km. Heathcote was the centre of the McIvor gold diggings (1853) named after the McIvor Creek. The origin of the name is obscure: possibly McIvor was a local pastoral employee or tradesperson. The name first appeared in correspondence concerning the Tooborac pastoral run. The McIvor Inn (1847), the first hotel in the district, was opened south of Heathcote on the Major’s Line. The Major’s Line refers to wheel-tracks left by the exploring party led by the New South Wales Surveyor-General, Thomas Mitchell, on his return journey from Victoria’s Western District in 1836. He passed through the future shire during 5-7 October, travelling north-east. Overlanders such as Charles Ebden and Alexander Mollison came to the district in 1837, using the ‘line’ as a guide. Within seven years of gold being discovered at McIvors Creek, the Heathcote borough was created, and within another four years the McIvor shire was created on 23 December 1864. The McIvor gold diggings, mainly east of Heathcote, were isolated from the Bendigo diggings. They constituted the beginning of scattered diggings extending through Costerfield to Rushworth. The diggings were in Box-Ironbark eucalypt forests, a woodland once comprising 13% of Victoria but reduced by timber cutting to about 2.4% in 2000. The contiguous Heathcote-Graytown National Park and the Rushworth-Heathcote State Forest comprise one of Victoria’s largest remnant Box-Ironbark areas. 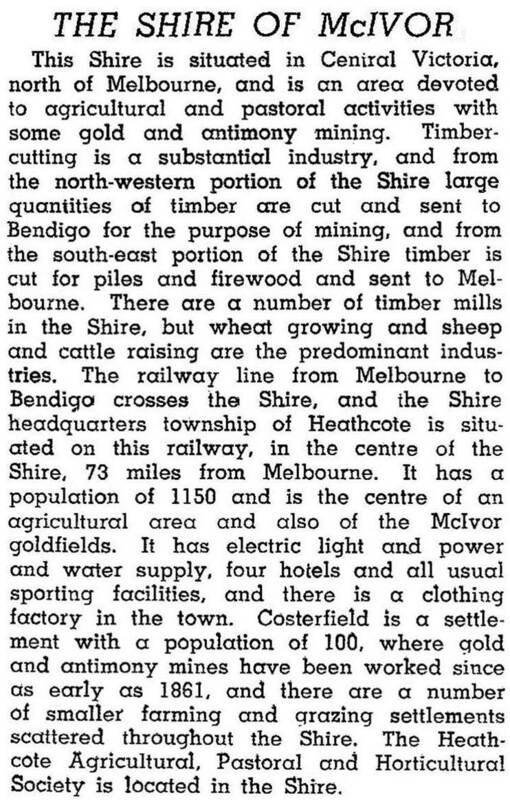 Timber cutting was extensive, for both mining props and firewood which were transported to Bendigo and Kilmore via a railway line opened in 1888. The line operated for 70 years. The shire’s better agricultural land was mainly south-west of the Box-Ironbark area. Heathcote township on the McIvor Highway had useful land along the McIvor Creek, and pastoral opportunities increased toward the shire’s western boundary, the Campaspe River. The large Spring Hill pastoral estate, near Mia Mia, had elevated open country which served as a testing ground in 1910 for John Duigan’s successful powered aeroplane flight, Australia’s first. There are monuments to Duigan on the Mia Mia-Lancefield Road. A short way north of Mia Mia the Campaspe River is met by tributaries from the Mount Camel Range, north of Heathcote, and by the Coliban River from the Dividing Range near Trentham. In 1908 the State Rivers and Water Supply Commission investigated damming the waters at the confluence of these streams, and preliminary work on a weir was started in the 1930s. Work was suspended until postwar prosperity allowed construction of the Eppalock Reservoir in 1961-64. The stored water was used for irrigation and domestic supplies for Bendigo and Heathcote. The lake was also used for speedboats. Drought during the 2000s reduced the reservoir to a small fraction of its capacity. In the 1870s Heathcote, along with Bendigo, was a premier wine-growing region. The Phylloxera vine disease ended that in the 1890s, but 80 years later vineyards were replanted in McIvor Shire. By 2000 there were six winemakers around Heathcote township alone putting the area on the map both as a wine region and a tourist destination. Its dominant agriculture, however, was livestock, with sheep and lambs comprising 95% of the total head count.